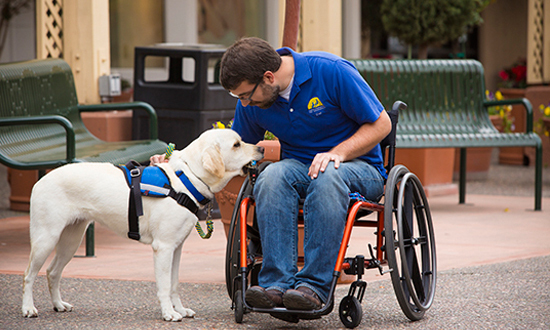 As a national organization, Canine Companions® enjoys relationships with a diverse group of corporations that support our mission in a variety of ways. These companies' marketing partnerships enable us to broaden the reach of our mission while generating important revenue to support our growth. Corporations interested in supporting Canine Companions can contact us at 1-866-CCI-DOGS (224-3647) or via email. For nearly twenty years, Canine Companions and Eukanuba have been dedicated to our mutual commitment to provide the very best nutrition to our dogs through all stages of life. Together we’ve developed an understanding of the relationship between nutrition, cognition and longevity in Canine Companions puppies and assistance dogs. We've partnered to increase awareness of volunteer puppy raising and our mission to provide assistance dogs for people with disabilities. In 2017 Eukanuba increased their commitment to Canine Companions by partnering with us in our Give Independence - Give a Dog a Job call to action campaign. As the National Strategic Partner of Canine Companions, Eukanuba has sponsored the 2012 Extraordinary E Litter, the 2014 Hero Litter, the 2016 Extraordinary E Puppies and in 2017 they are sponsoring a video highlighting our partnership and the journey from puppy to assistance dog. Building on an initial $300,000 donation to Canine Companions for Independence in honor of the retailer's 20th Birthday in 2017, Build-A-Bear® and Build-A-Bear Foundation™ continue to increase their commitment to Canine Companions by leading national fundraising campaigns to help provide even more service dogs to children and adults with disabilities. This year we are pleased to partner with Build-A-Bear in two great projects: The Hugs N Hope™ campaign, and naming and following a Canine Companions puppy. 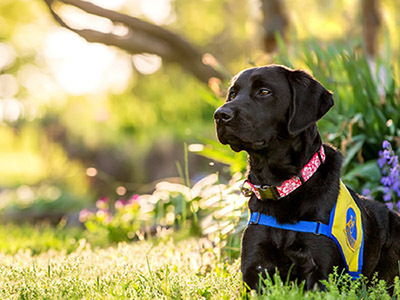 Check out Canine Companions’ Northwest region program manager, Kim Mizia, on Build-A-Bear radio with morning show hosts, The Moseleys, as she talks about what it takes to be an awesome Canine Companions assistance dog. 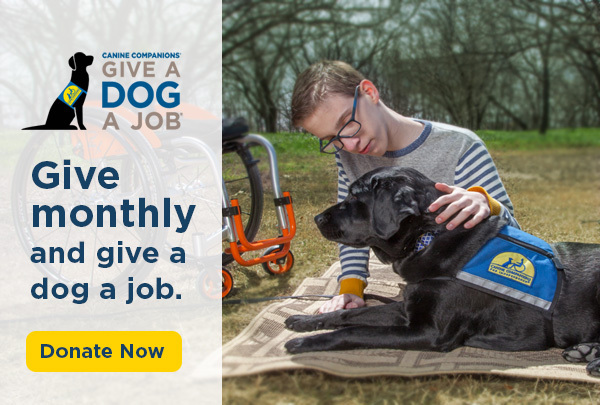 Chrysler Pacifica, the most award-winning minivan in the United States, and BraunAbility, the world’s leading manufacturer of wheelchair accessible vehicles and lifts, have partnered with Canine Companions for Independence’s Give a Dog a Job® campaign. On their joint, co-branded platform driveindependence.org, Chrysler and BraunAbility are raising awareness and generating funds to support the important mission of Canine Companions. In February 2017, our partnership was launched at the Chicago Auto Show during a joint press conference showcasing the BraunAbility upfitted Chrysler Pacifica. Within the press conference, Canine Companions assistance dog team Wallis Brozman and Mork demonstrated how our assistance dog’s skills can be integrated with the minivan’s technology to enhance mobility and independence for a person with a disability. Learn more about our partnership in the video below and by helping us Drive Independence and Give a Dog A Job. Jam City, the leader in mobile gaming apps for bubble games, joins Canine Companions as a new partner. Jam City’s support comes through their newest bubble game Snoopy Pop, featuring the PEANUTS characters and messaging around the mission of Canine Companions for Independence. Jam City has made a generous $100,000 contribution to support the mission of Canine Companions. Snoopy Pop is available for free download on mobile devices and tablets. As a major promotional partner, Nickelodeon and PAW Patrol have created a public service announcement (PSA) to raise awareness for the mission of Canine Companions. Canine Companions and PAW Patrol are currently partnering in a 90 city live theatrical tour through 2017. Click here to learn more. Southwest Airlines has extended an exclusive policy permitting Canine Companions puppies to travel with their volunteer puppy raiser in the cabin, free of charge. The success of this policy in action has initiated additional employee engagement opportunities at Southwest's TOPS Headquarters. As a major veterinary supplier, Henry Schein is working with Canine Companions to distribute Puppy Care Packages to our puppy raisers across the country. These kits help defray some of the cost of caring for a Canine Companions puppy in the first 18 months of life. Canine Companions® thanks all of our national partners and all of the local companies that contribute to us throughout the year. Your support makes it possible for Canine Companions to provide expertly-trained assistance dogs entirely free of charge to recipients.